Blurb: A perfect balance of action, intrigue, and romance. Simply magical. Review: This book is something magical. Unlike most paranormal romances now where two people automatically love each other and we read 300 pages of them and their issues, in this book you get to watch two people FALL in love. Really fall in love. And in the meantime we get to see a wonderfully rich and detailed world, experience heart racing adventures, and go through heartbreaking tragedies. This book perfectly balances action and intrigue, love and plot. I found myself on the edge of my seat at some parts, and melting into a puddle at others. She's been able to mix the romance into the story in such a way that the storyline is still pure. There are no cheap shots or "oh geez" moments. About 90% into this book I was thinking, "Wow! This is such an amazing action story!" At 100% I had tears in my eyes and thought, "Wow. What an amazing love story." Now I'm just thinking, "Wow. What an amazing book." If you'd like to see a review of someone who DIDN'T like this book, check it out here: Emily's Reading Room. She has some really valid points about things that usually bug me, but didn't in this book. So check it out! I was surprised by how amazing this book was, not because I didn't think it had potential, it just really caught me off guard. I agree too, the love story between the characters was so beautiful. *scratches head* How could we with such similar reading taste have seen this book so differently? I'm so glad you loved this book! I thought it was fantastic and I'm eagerly awaiting the next! I'm so glad to hear that the reader actually gets to watch the characters fall in love! I've grown so tired of the instant love, I do want to watch characters slowly build a relationship. I loved the fact that there was no insta love but I couldn't really connect with Aria! I loved Perry though!! I've read both your and Emily's reviews for this one, and still remain on the fence. While the premise looks really interesting, I've read several reviews that said the characters fail to live up to it. So I might still look into this one, but I'll be working on getting through my TBR pile first. Oh I'm so happy to hear that not only was it wonderful, but that it stayed away from insta-love! The story is told in the point of views of Aria and Perry. They go hand in hand in telling their part in their journey. Never missing a step from each other and not having you skip a beat on what's going on. 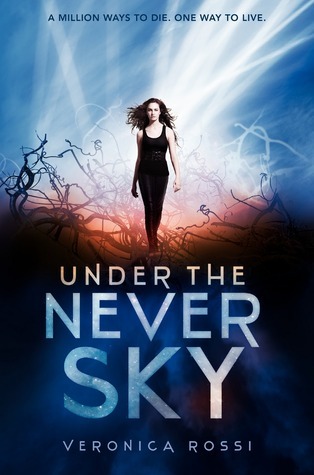 Veronica Rossi has done a fine job in getting you in the mindset of 'Under The Never Sky'.